Giant pandas spend their lives eating bamboo and walking around the forest floor. They are good climbers and can also swim. They don’t build dens (except to put cubs in) or hibernate. They prefer shallow slopes and solitary living. If it is too cold up in the mountains they head down to the valleys where it is warmer. Because of their low-energy diet they avoid stressful situations and exertion, preferring shallow slopes and solitary living. They use scent markers to avoid one another. Giant pandas don’t roar like other bears, but bleat like goats, or or honk, growl and bark to communicate. Cubs whine and croak for attention. The giant pandas spend as long as 14 hours eating per day. A giant panda needs about 12 to 38 kilograms of food per day, approximately 40% of its own weight. 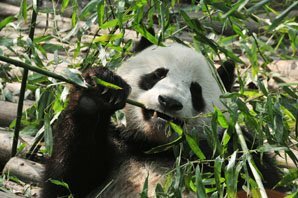 The giant pandas prefer eating tender stems, shoots and leaves of bamboo, all of which are richer in nutrition and lower in fibrins. 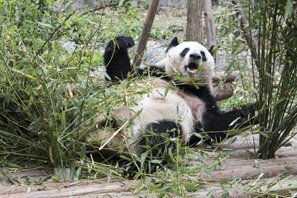 Read more about What do Giant Pandas Eat. 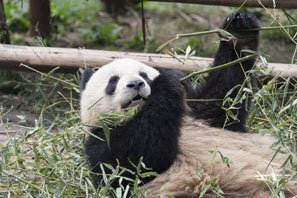 In addition to eating for about half a day, the giant pandas spend the rest of their time in sleeping. In the wild, the giant pandas sleep for 2 to 4 hours between its two meals, whose favorite sleeping poses include lying flat on their backs, lying on their sides, lying on their stomachs, stretching their paws and rolling themselves up into balls. The keepers feed giant pandas twice a day at regular times in the zoo, therefore, the giant pandas spend most of their spare time in rest, and they seem very lovely even during their sleeping time. pandas get into positions of various kinds with their seemingly clumsy bodies. Their favorite sleeping position is putting their hind paws on the trees with their front paws shading their eyes. 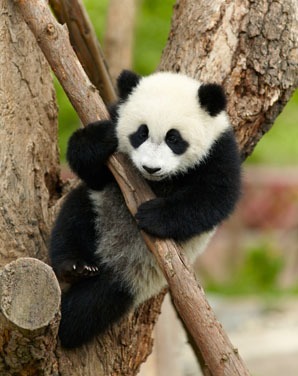 The pandas are very nimble in climbing trees and run rapidly in danger. They propose to their partners, run away from danger and evade stronger competitors by climbing trees. 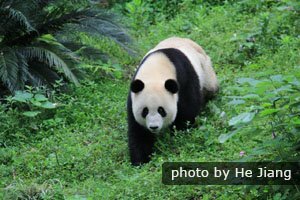 The giant pandas also walk into the valley, sneak into mountain villages or residences, which play with round-shaped utensils as toys and later abandon them in the wild. Once in a while, the giant pandas also show their kindness to sheep and pigs by sharing food and rooms with them. Panda families don’t live together. They are solitary, each female having a well-defined range. Males generally live apart, except for in the short breeding season (March to May), when they compete for female attention. Females raise the cubs alone. With an uncommunicative and eccentric temperament, the giant pandas prefer freedom of being alone, and sleep in the daytime and look for food in the night. In addition to one month spent with their partners during mating season, most of their time is spent alone. The giant pandas have a very docile temperament in most cases, and they often lower their heads or shade their faces with front paws to conceal their true appearances when they come across a man for the first time. Seldom actively attacking men or other animals, the giant pandas always evade them when coming across them. However, the giant pandas consider their cubs holy and untouchable once they give birth, and they will burst into rage at such small things as their cubs being watched by visitors. The giant pandas can stretch their paws and open their mouths wide like cats to make themselves more comfortable. They can also shake water off themselves like dogs after a heavy rain. 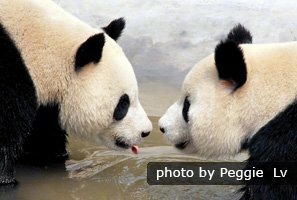 Most communication among giant pandas is reached by scent markings left on the habitat, by which they can find their previous partners during mating season. After finding their partners, they will communicate with sound, which is barely understood by humans, and they will remain silent when simply but playing. Therefore, we could predicate their behaviors simply by their sounds. The secret to keeping peace in the habitat is dividing territory by scent markings. 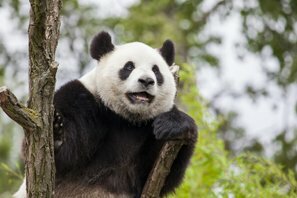 The giant pandas leaves their glandular secretions on tree stumps, walls and ground in their habitats, by which they gather together or evade stronger competitors. In the non-mating season, the giant pandas would walk away as soon as they smell scents of newcomers. In the mating season, the scent of a female giant panda means that she is ready for male pandas to mate. 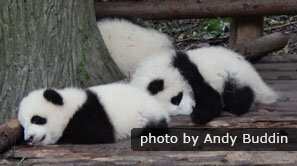 In addition to glandular secretions, urine is also employed by pandas for scent markings. While making markings, the giant pandas usually shake their heads with mouths half open, and then strip the barks from trees where they urine to attract attention of other pandas. The female giant pandas are monestrous, which usually falls in March to May and only lasts 2 to 3 days each time. 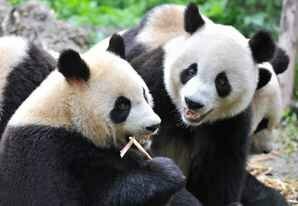 The female giant pandas will leave their partners after mating and rear their cubs alone. Giant panda gestation is about 83 to 200 days, and usually give birth from July to September. Cubs usually were born in hidden hollow trees or natural dens, where the branches and dry hays well-prepared by mother pandas are available. Normally, the giant pandas are monotocous and rarely multiparous. 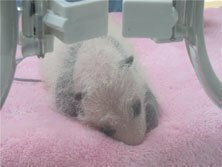 Even the female giant pandas have two cubs at one birth in the wild, they would choose to take care of one and abandon the other. 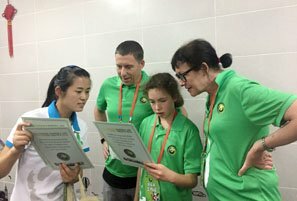 Read more about Giant Pandas Life Cycle. 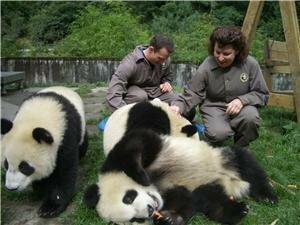 2-Day Panda Keeper and Chengdu Highlights Tour — Join a Panda Keeper Program and take care of them. 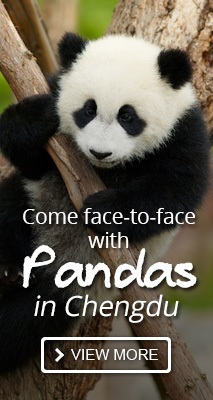 4-day Wolong in-depth Panda Tour — Explore panda&apos;s nightlife without tourists and noise in the brand new center.